Why Won't You Grow?! : NaBloWriMo #7: What's Today's Great Idea? What should I write about today, after the sun has gone down and I'm tired and all I really want to do is sit and stare? But I've got this month-long commitment staring me in the face and I really want to go through with it? And so I'm sitting here in a brief moment of quiet, trying to think of something that I could write quickly but might actually be of interest to someone? Since tomorrow is Election Day, I guess I could broach the topic of politics. But I hesitate to do that because I'm not really informed about all of the issues--as embarrassing as that is to publicly admit. (I mean, how can a seemingly well-intentioned, responsible adult NOT take a minimum amount of time to read through summaries of what are extremely important issues to make sure he doesn't inadvertently support something stupid, or (much more likely) NOT adequately support something that is important. But that is how I see myself right now. Stupidly unprepared. Now, I am going to vote certain ways on some issues. And if I was going to take the time to really write on this topic, I'd explain why I am supporting things the way that I am. But to really, honestly do that writing justice and to give it the thoughtfulness it should get, I'd need to devote a lot more time to it than I am going to get tonight, in between washing the dishes, helping get the kids to bed, and crashing after a glass (or two?) of wine. It might be interesting, at a later date when I can better prepare, to go a bit more into my own personal political stances . . . probably in broad strokes. It might, maybe, provide some interesting insight into me? But we'll see. If I truly felt that anything I write tonight might affect someones vote tomorrow, I guess I'd feel more guilty about my cavalier stance. But I'm not under any illusions where that is concerned. So . . . what then? Lynda and I did rent Crazy, Stupid, Love last Friday night--the movie with Steve Carrell, Julianne Moore, Emma Stone, and Ryan Gosling. Let me say that it was a great movie and one that I was not at all expecting based on what I remembered from the previews. Congratulations to the marketers of this film for NOT giving away all of the significant plot beats in this film (and there were some very significant ones) before anyone ever sat down to watch it. This film did a good job of presenting an honest depiction of relationships. And it gave Lynda and I the opportunity to react to it, pause and discuss the decisions of a character at a given moment, condemn or support that decision, and then move on. I find that this is one of the things I enjoy the most about these sorts of romantic drama films. I can throw the scenarios at Lynda and ask her "What if that happened to us? Would YOU react that way if I did something like that to you?" It's kind of a game of hypothetical relationship Chicken. We're lucky (and smug?) enough to say That would never happen to US! We'd never have to do things like THAT! so we can play games with the events and indulge our relationship imaginations. I'll say that after I watched it, I wanted to make some sort of comparison between it and American Beauty. (Which is a compliment, in case you were wondering.) Both deal with the ups and frequent downs of the marital relationship. Both deal with the notion of mid-life crisis. Both present interesting views on misunderstandings of various sorts. Both play off middle-aged relationships and young relationships. 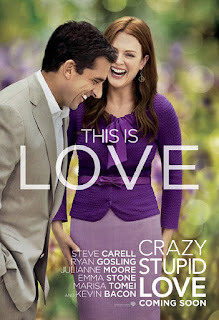 Crazy, Stupid, Love was the more unexpected of the two . . . and American Beauty had the better score. But there were both good, I think.